President Muhammadu Buhari has again congratulated the President-elect of Gambia, Mr. Adama Barrrow on his electoral victory. The President had earlier congratulated him on Saturday, December 3 after his triumph was announced. Senior Special Assistant to the President on Media and Publicity, Garba Shehu made this known in a press release issued on Monday in Abuja. “In a telephone conversation with him this afternoon shortly before his trip to the International Forum on Peace and Security in Senegal, President Buhari expressed his gladness at the conduct of the contestants before, during and after the elections.” He said. According to him, President Buhari urged the President-elect Mr. Barrow to ensure that the transition process is also as smooth as the electoral process and carry everyone along in his task of taking the Gambia to a new level. “The President also expressed his admiration at the existing rapport between the President-elect and other contestants especially the current President, who lost the election, stating that democracy, rule of law and respect for each other are fast taking roots in Africa and that Gambia has also become a role model for Africa and the world at large.” He added. In 1994, following corruption allegations against the Jawara regime and widespread discontent in the army, a largely bloodless and successful coup d’état installed army Lieutenant Yahya Jammeh into power. Politicians from deposed President Jawara’s PPP and other senior government officials were banned from participating in politics until July 2001. A presidential election took place in September 1996, in which Yahya Jammeh won 56% of the vote. 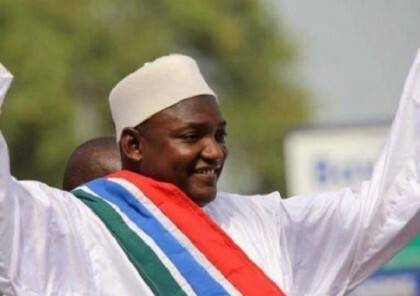 Jammeh has been the President of Gambia for 22 years, he was seeking his fifth term until his defeat on 1 December 2016 by Adama Barrow in the presidential election. Its area is 10,689 square kilometres (4,127 sq mi) with a population of 1,882,450 at the 15 April 2013 census (provisional). Banjul is the Gambian capital, and the largest cities are Serekunda and Brikama.